Evvos designs and develops Sigfox-based, battery-powered wireless, sensor data acquisition devices and a cloud integrations services middleware application for gathering, processing, transmitting and integrating sensor data for agriculture, industrial and environmental monitoring. Sofia, November 15th, 2018. 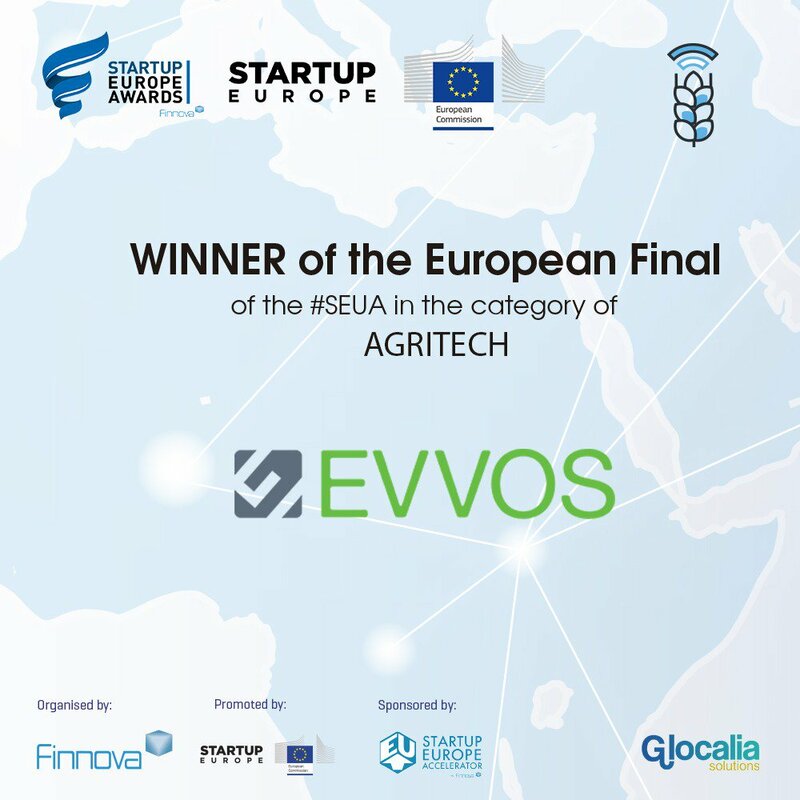 The Luxembourgish startup Evvos has been recognized as the best European startup in the AgriTech category at Startup Europe Awards (SEUA), an initiative of the European Commission and the Finnova Foundation in collaboration with Startup Europe. After going through several stages and being selected to represent Luxembourg in the AgriTech category, Commissioner for Society and Digital Economy Mariya Gabriel handed to Evvos the document that accredits them as the European winner. The Startup Europe Summit 2018 was held in Sofia, Bulgaria in the presence of the Prime Minister of Bulgaria, Boyko Borissov and several European Prime Ministers. In her speech, Commissioner Gabriel congratulated Evvos and the rest of the European winners and encouraged them to continue innovating and growing. “Europe needs to have more startups like you. More of your passion, dedication, perseverance, talent and energy. You have already proven that progress is possible. Europe is determined to support innovation and entrepreneurship. You have shown that success can come from anywhere in Europe”. Evvos’ CEO, Georgi Taskov stated, “I am honored to represent Luxembourg at the Startup Europe Awards, grateful to all who voted for Evvos, for the relentless support we receive from the Luxembourg Government, Luxinnovation and Paul Wurth InCub. I am also incredibly proud of our team and the fact that our technology is already being used in 12 countries on 3 continents”. StartUp Europe Awards proposes an open innovation methodology through public-private partnerships, “to help public entities find solutions to local challenges, and to assist startups with their innovation undertakings and pilot projects supported by European Union funding” said Juan Manuel Revuelta, director of the Startup Europe Accelerator of Finnova Foundation. Evvos and the other European winners of the Startup Europe Awards will gain visibility thanks to the Media Partner Alliance, which has 25 members from Spain, France, Belgium, Latvia, Luxembourg, Italy, Slovenia, Croatia, Cyprus, Ireland, Sweden, Mexico, Norway and Denmark, among others. Startups will also have access to a mentoring program through the Finnova Foundation’s Startup Europe Accelerator, which enables them to boost their projects and make them succeed worldwide. Evvos designs and develops Hardware and Software for Sensor Data Acquisition. Its wireless battery-powered data transmitters are capable of connecting a variety of sensor with a pulse, voltage, current, I2C, 1-wire or SDI-12 output. In addition, Evvos has also developed a device (transmitter) to acquire, process and transmit data from temperature sensors (thermocouples K, J, T, N, S, E, B, R and highly accurate Pt100/1000 sensors). Evvos’ innovative hardware technology is highly efficient in terms of power consumption and uses Sigfox LPWA (low-power wide-area) network to transmit sensor data to the cloud. Evvos’ Cloud Integration Services (CIS) middleware application enables customers to easily integrate sensor data with their own systems, applications and platforms. Evvos’ in-house hardware and software teams collaborate to ensure optimal interoperability between sensors, devices and applications. Evvos helps utilities companies monitor their water supply network and is also active in precision agriculture and environmental monitoring – pressure, temperature, humidity, precipitation, soil moisture, wind speed and direction, IR thermometers, pyranometers, fluid levels and more.